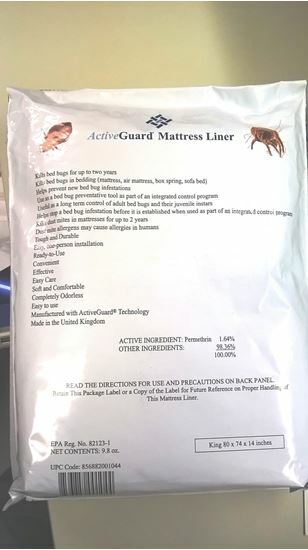 ActiveGuard® Mattress Liners, used as part of a bed bug treatment and control strategy, kills bed bugs dead and provide peace of mind as a revolutionary alternative to encasements. Developed as a natural extension of the globally used mosquito nets, ActiveGuard® kills bed bugs in mattresses and box springs. Superior to any other bedding cover, the breathable, thin ActiveGuard® Mattress Liners can be installed onto a mattress or box spring by one person in less than a minute, and the liners are comfortable and provide security that no other mattress covering or product can deliver. ActiveGuard® Mattress Liners require no airborne sprays or powders, and are not subject to the ripping and tearing frequently experienced by encasements often rendering them useless. ActiveGuard® Mattress Liners also have been lab and field tested on a variety of bed bug strains by research entomologists. It is one of the few bed bug products with both published lab and field data.